What are the style choices for the coming season ? I’ve summarised below what a couple of UK style magazines say. And added a note about the trends on US Vogue’s Style.com. Long ago, everyone had to wear the same look to be ‘fashionable’. Then in the 80s it was either power dressing or ‘anything goes’. Now there is a range of style choices, though they are usually some version of ‘classic’, ‘casual’ or ‘dramatic’. The general styles not catered for by these fashion editors are ‘romantic’ and ‘sporty’. People who like lace and embroidery are expected to wear beading, fringe and gathers. I don’t think they’re the same at all. Perhaps looking pretty isn’t a current stereotype, Or perhaps both gentle and more active people don’t make for eye-catching photos and exciting copy. Well, people who prefer softer lines know to look in the Butterick catalogue for patterns. People who enjoy a sporty style may like Jalie or Green Pepper patterns. And Stella McCartney designs for Adidas. Trench or double breasted coats, ruffled blouses, white shirts, slightly tapered skirts (knee length) or pants, dresses and matching suits often with defined waists. This camel coat is from Donna Karan. (Style.com links are very slow in my browser. To see the slide show, click the link under the catwalk photo on Style.com) Look at MaxMara for trenches. And Chanel for lovely wearable suits and evening dresses. Or Burberry Prorsum for an edgier look. There are many appropriate patterns in the Vogue catalogue, so I haven’t picked out specifics. If much of Burberry goes too far for your pleasure, look at Nancy Erickson’s patterns and excellent newsletter about how the classic style changes with the trends. Soft long jackets, fur tops, plaid big shirts, slim pants, ankle boots, big scarves. Get inspiration from parts of the Gucci show, though this style is as much street as catwalk. Here’s a wardrobe pattern for this look (McCall’s 5983). Add the jacket from Vogue 8546. Many shows include jackets with cut on elbow length sleeves and big turn-back cuffs. 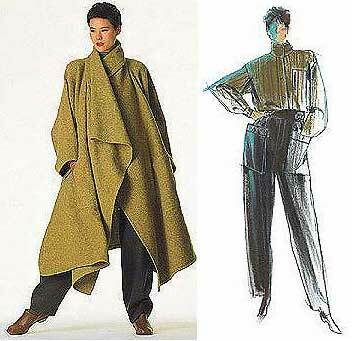 There are several patterns in the McCalls and Butterick catalogues, or try Vogue 8603. And the long tunic look includes thigh length cardigans. don’t care, anything goes together, relaxed but expensive, loose large casuals. Here are some possible ‘big easy’ patterns (Vogue 8538, Vogue 8499, Vogue 1112. Despite what the style description says, these are not just big but interesting too ! Short skirts, tunic dresses, drapes, gathers, handkerchief hems, long fur and other vests, grey tees/ sweat shirts. Animal prints, big soft bags, thigh boots. Iconic show Isabel Marant, or Kenzo if you prefer calf-length skirts. Butterick 3311 includes a fur hoodie vest. See also Butterick 5359. McCall’s 5287 and Butterick 3257 are oop, still available in the US but not UK. There are many thigh length tunic-dress patterns available, especially at McCall’s, such as 5926, or Anna Sui at Vogue patterns. Big shouldered jackets, short capes, buckled boots, hip slung belts, slim pants, tunics. Lots of studs, leather, metal and shine, black and grey. Burda have ‘biker with attitude’ jackets. 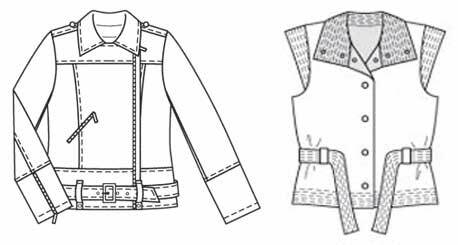 Go to Burda and search for the pattern numbers : 507B for the jacket and 7593 for the vest. Add flanges in the jacket armholes for the pointed shoulder look, with shoulder pads to keep the shape. Corset looks, mini skirts, thigh boots, berry colours, bows and stiff ruffles. Key-note show Marc Jacobs at Louis Vuitton. or McCall’s 3674 is a Moulin Rouge pattern, oop but available on ebay. For a less in-your-face version see Vogue 2810. with an Oscar de la Renta evening coat (Vogue 2714). For other quieter special occasion wear, see the US Vogue styles below. I’m not in tune with retro, so am not a good person to comment. For original patterns, go to LanetzLiving, Patterns from the Past, or So Vintage. There used to be some lovely Vera Wang Vogue patterns with transparent panels, sadly no longer available. For a quick version of the look, make a coverup from chiffon, perhaps Vogue 7161. This drapey Donna Karan dress is Vogue 1119.. See also the designer eveningwear at Vogue patterns. Of course these notes are a summary of a simplification. And happily we haven’t actually got to wear any of them unless we want to. If none of the looks are ‘you’, pick one feature of a trend, such as a touch of fur, animal print, or glitter, or a longer top. I could wear Downtown Cool, though I’m not an urban person. But I might add some heirloom sewing or quilters’ embellishment, which probably isn’t at all Cool 😀 I would not be happy if I was covered in bows and flounces or leather and grommets, but I know people who thrive and flourish in them. Anyway it’s fun to explore the possibilities. Colours need care. As usual there’s much black, which is sad as up to half of us don’t look our best in it. A good alternative is grey as it has many possible shades, though it needs experimenting to find one that flatters you. Or try dark brown. Accent colours are red, berry shades, peacock blues, and nudes, none of which are easy for everyone. Non-bluey reds are good on me, but otherwise I will as usual be going my own naturals way on this. As you can see, there’s a lot of choice about style ! Different groups of fashion editors think different things important. But there is some agreement. All three emphasise the big pointed shoulder look, which is the main ‘newsworthy’ theme of the season. Though it’s not very practical or flattering as a shoulder shape for most of us. There are many signs that big shoulders are coming back – not a look that’s good on me. Two editors notice classic styles. Both UK editors give a boho style and a casual style. The three ‘special occasion’ styles each catch the interest of only one group. There is also overlap. If you look at a wider range of photos you’ll see that many catwalk outfits are a mixture of these styles. And there is a lot going on that doesn’t fit neatly into these editor labels. To my eye, the elements that keep reappearing (apart from all the black leather and silver !) are tunics, slim pants, fur vests, and long jackets, often with wide lapels or double breasted, band collars, waist-deep V necks, pleated fullness (often in balloon shape short skirts), big scarves and neck rings, boots. But this is just one person’s view. See the Style.com Designer Directory if you want to spend the whole season happily looking at clothes instead of sewing them 😀 – and explore a much wider range of styles. This entry was posted on September 17, 2009 at 3:03 pm and is filed under current fashion, personal style. You can subscribe via RSS 2.0 feed to this post's comments. Both comments and pings are currently closed. Love your selection of patterns with the review. What a great blog you’ve started! Your blog is a fun read! Thanks for compiling and sharing this with us.